Sunday, the first day of 2017, Kathi and I left the I-35 RV Park in Elm Mott, TX and drove to Cedar Breaks Park. We had site 16 reserved, but they told us our motorhome was too long for that site and also a problem with the water so they moved us to site 58. We drove into the park and discovered 58 was too unlevel for our motorhome and the front wheels would be off the ground about four inches. Kathi drove the Jeep back to the office for a third choice. 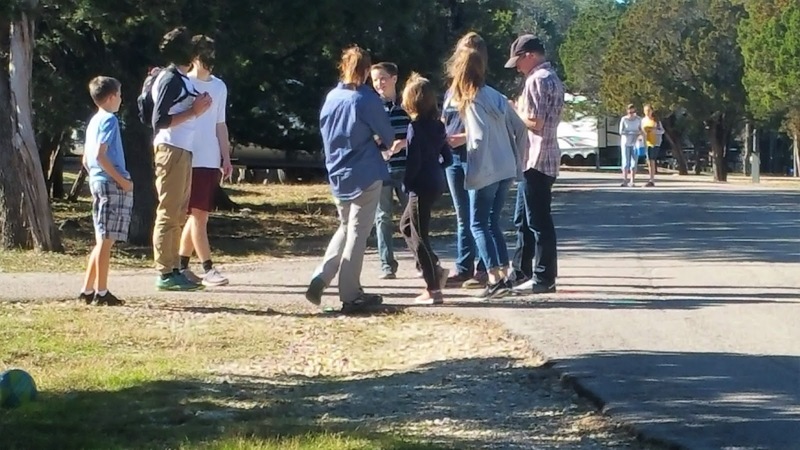 She found out a section of Jim Hogg Park across the lake had been shut down and the campers had moved to Cedar Breaks, leaving very few sites available. They put us in site 20, but only for five days, since it was scheduled by someone else over the weekend. We gladly took site 20 for five days. Kathi and I were drinking coffee and reading the news on Monday morning. I talked to AJ on the phone and he had an early appointment and it was raining in Austin. He would have to walk to the bus stop and get soaking wet, so I decided it made sense for me to drive to Austin and pick him up for his appointment and bring him to Lake Georgetown with me, so he could spend the rest of the day with Kathi and I. We planned to see him later in the day, anyway, so it was a small adjustment to our plan. I left Kathi drinking coffee and took mine with me. Before I drove half way to Austin, the sun was shining, but now I was committed. Obviously, I cannot predict the Texas weather any better than anyone else. The sun was shining bright right in my eyes through the driver’s window as I drove into Austin on I-35. The roads were still wet from the early morning rain, so I drove slow to assure I could avoid a traffic mishap. Fortunately, there was little traffic. I assumed it was because many people were taking the day off for a holiday. Driving back to Georgetown, we went through McDonald’s for sausage biscuits and coffee to eat on the way to the Lake. We spent the morning chatting and watching the neighbors out the window. There were younger kids on skateboard, bicycles and roller skates enjoying the small road inclinations. 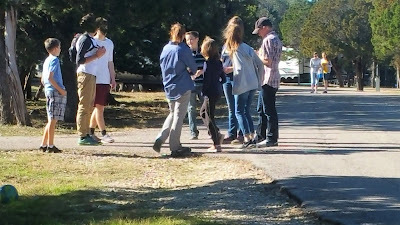 There was also a group of teenage boys and girls exploring lake boundaries and having a good time outdoors on a beautiful day. 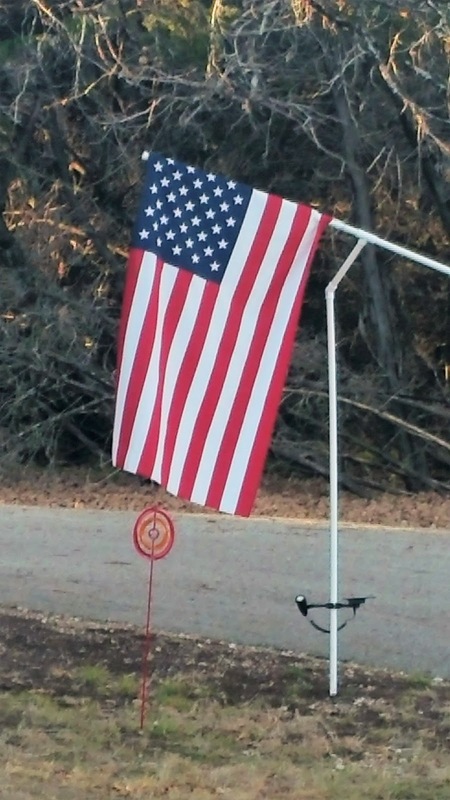 Most RV owners are patriots. Boats and jet skiers are on the Lake. We decided to have lunch on the way to take AJ back to his apartment. We went by Catfish Parlour, but it was closed. It is usually closed on Monday, but I had forgotten. Instead we stopped in Round Rock and had lunch at Cracker Barrel. Kathi had roast beef and mashed potatoes. AJ wanted pancakes and I ordered the two-meat breakfast. Kathi told us she had enough Cracker Barrel for a while, so next meal out, I will be more creative. Maybe I should offer to build a campfire. That was a joke. With our stopped-up heads, we could not take being around a campfire. We stopped at Walmart after lunch so AJ could do some grocery shopping, then we drove him back to his apartment. It was another great day to be alive and we are anticipating a great new year.